In recapping last night’s performance, it was all about them Bulls. Both Gasol and Butler did not disappoint last night as both went for over their projection of 46 and 49 respectfully. Additionally, you had Ryan Anderson tie a career high in points as we predicted and secured a 50+ fantasy performance along with Cole and Rondo, our top lineup scored 353 on FanDuel last night and cashed in all contests. 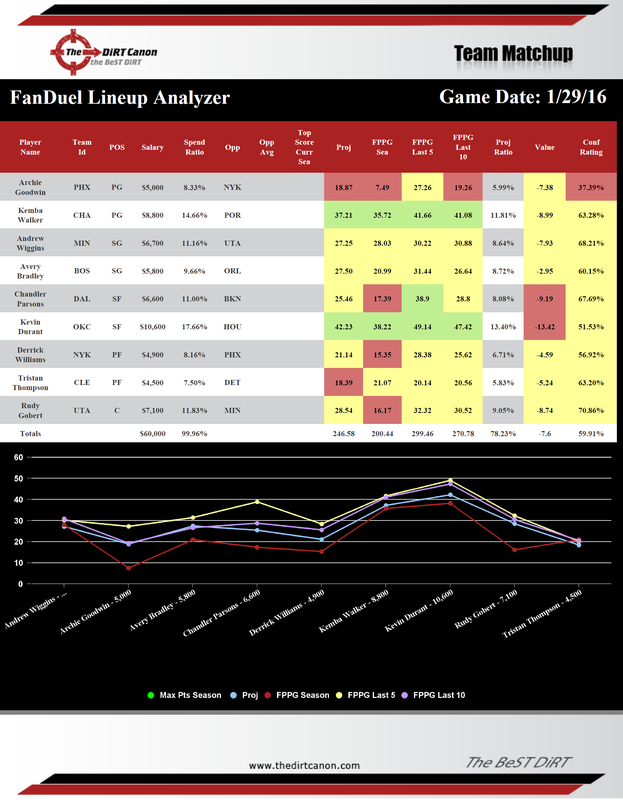 Now, I will walk you through 5 key points and end with The DiRT Canon top lineup for both FanDuel and DraftKings, along with the lineup analysis for you to consider tonight! The top overall value play for tonight is Chris Bosh. He comes in with a very close projection to his needed points for tonight’s salary to be of value. Rarely do you get a positive value number for that player’s salary when they are projected above 35. Take Bosh tonight. The 2nd overall value play is Tyson Chandler. While splitting time with Len, he is still getting over 25 minutes and he will get the boards tonight. Look for a 30+ fantasy point performance from Chandler again tonight. The 3rd overall value play for tonight is Dion Waiters. He has been averaging over 30 minutes and the OKC vs. HOU matchup is the highest projected game per Vegas tonight. 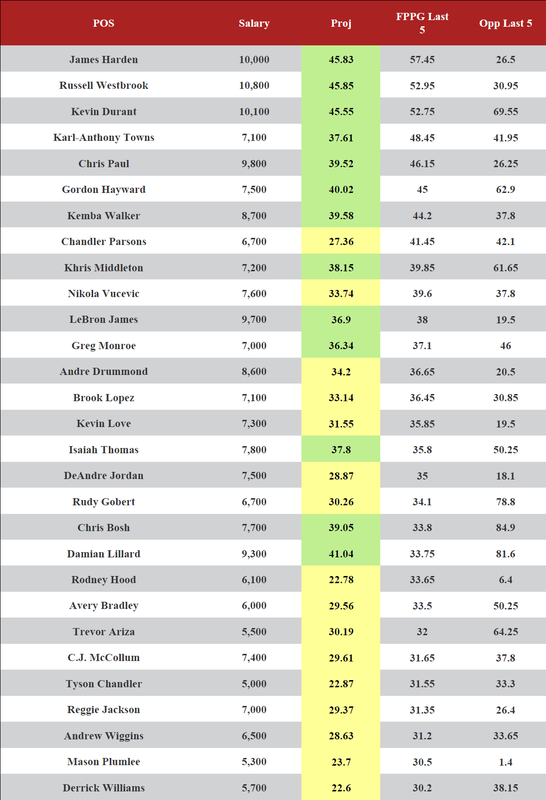 Below is the average fantasy points per position for both FanDuel and DraftKings based on the minimum winning score for each site. This should give you an order to your lineup selection process. The average winning score was not affected by last night as such keep your order rolling with PG, PF, C, SG, SF. The key for tonight is getting value at Center and then taking the high end guards. Westbrook should be your chalk play for tonight. 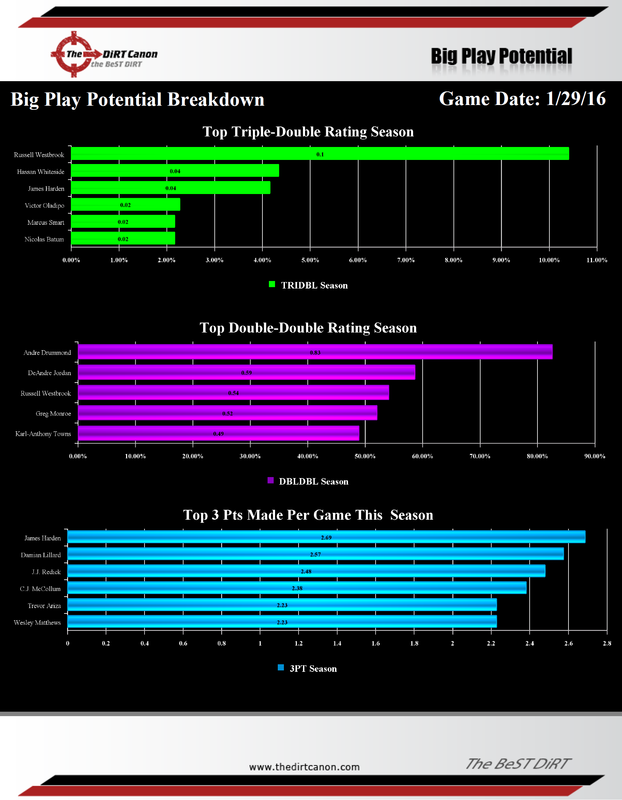 We have officially released the full version of the Big Play Potential and this should be a highly used set of information specifically for DraftKings as this will be a big indication for having players hit those all important bonuses. The top Triple-Double guy for tonight is Westbrook with just over a 10% chance of hitting this mark. The top Double-Double is Drummond is an 83% chance of hitting this mark tonight. The top 3 point player for tonight is James Harden at 2.7 three’s tonight. The top overall #AbsoluteMustHave is Russell Westbrook, just take him and you will get at least 50 fantasy points. This is a lock! The top overall #AbsoluteNotable is Kentavius Caldwell-Pope as he comes in with a projection of 30.46 and is leading the team in minutes played per game at just under 40 minutes per game. The top overall #AbsoluteSleeper is Kelly Olynk. His projection of 25.15 is the highest for him in quite some time and he presents that value you need for a big guy. 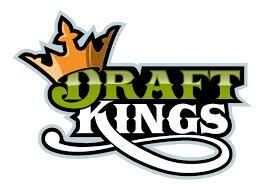 For DraftKings tonight we are going to roll with Harden and Lavine. We will have another lineup with Westbrook but the top overall projected lineup for tonight based on our custom algorithms had Harden and Durant as the chalk plays. Then you would have Lavine at PG along with Devin Booker and Langston Galloway for additional guards. Taking Hawes at Center for value along with Marvin Williams and Derrick Williams assuming that Porzingis and/or Anthony will sit out again tonight which as of 6:30 EST they are both expected to play so you might consider a different play here such as Olynk at center and then rolling with Pope at guard. For FanDuel, we have some key players such as Kemba, Wiggins & Durant as our top players. At Center we are going with Gobert, who has quietly been tearing it up tonight. Tristan Thompson should have a good game again tonight as he is back in the starting lineup along with Chandler Parsons who is also a strong play for tonight. 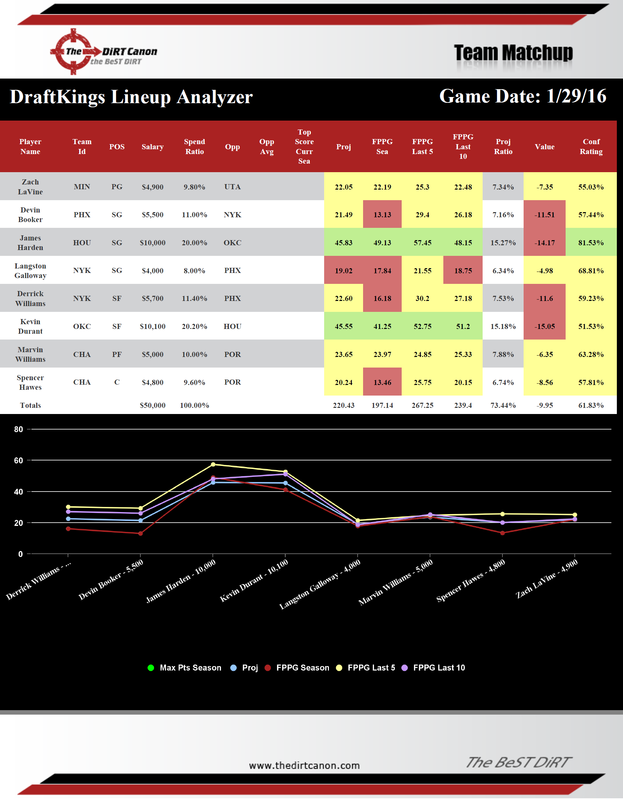 If you would like for us to analyze your lineup, just contact us here or DM us on Facebook or Twitter.